Why 72 hours? How long is that anyway? Don't make me do maths!! 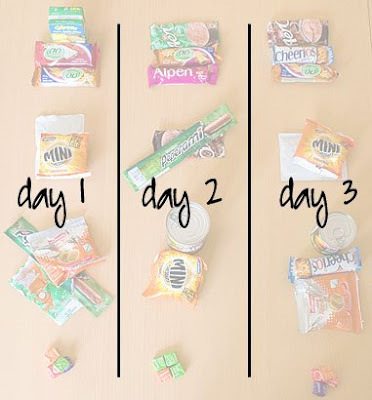 Turns out that 72 hours is three days and you'll need a three-day supply of goodies because in an emergency such as mass evacuation (think hurricane, flood, etc) it will take about that long for government agencies to arrange food and supplies on a mass scale. So at least you'll have enough to keep you going until relief comes through. When I first heard about 72-hour packs I thought sure, they sounded like a good idea but I felt overwhelmed. Where do I start? What do I include? I can't pack for going away overnight without it taking up a whole big suitcase, how am I going to fit three days' worth of stuff into one little backpack? I attended a class at an Enrichment evening given by Judy Winter (who is my Pampered Chef consultant, incidentally) and she made it make sense. She also provided us each with a little plastic pouch containing a shopping list, menus for three days and other printed information. They say that wisdom is applied knowledge - so here I am, sharing my wisdom with you! 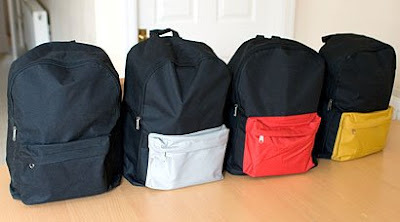 First, I bought us each a nylon backpack from Tesco. They were only 97p each (that's less than $2) and each has a different colour pocket because looks matter even in an emergency. The black one is Grant's, grey is mine, red is Daniel's and yellow is Noah's. 1. Two litres of water. 3. Roll of toilet paper, double-wrapped in plastic film to keep it dry. When creating the packs I'd buy a little at a time and each week we'd put the new bits into our packs together. The kids loved it! I printed them each a checklist so they could mark off as they put items into their kit. 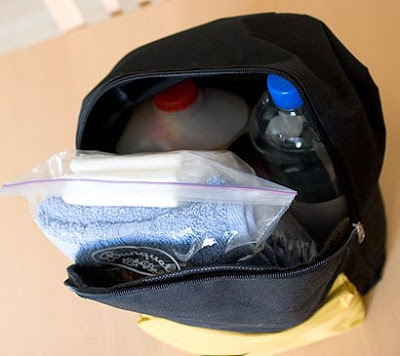 The lists helped me to see at a glance what was still needed when adding items to my shopping list. CLICK HERE TO DOWNLOAD A CHECKLIST! 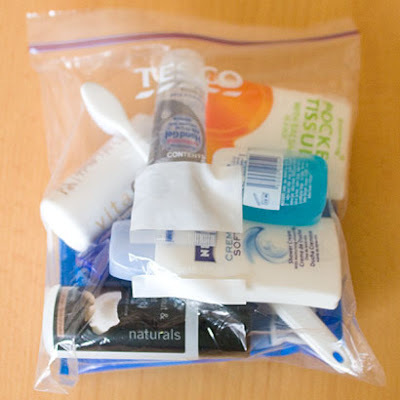 Each kit contains a 6 pint (3 litre) milk carton containing all of the food you'll need for three days. 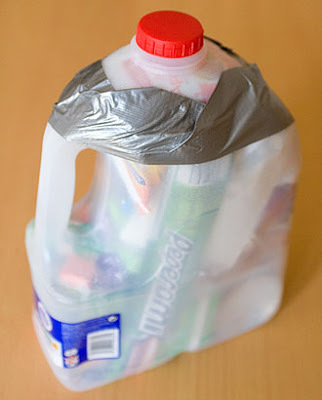 You simply wash out the carton, cut the top off, stuff all of the food inside and then duct tape the top back on. I know it isn't a lot of food but come on, it's an emergency, not a vacation. You'll be glad of anything to eat at all. 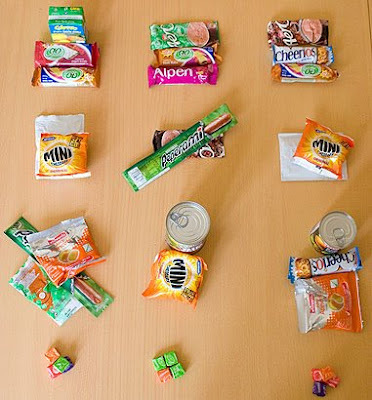 And once you have filled your kit with all of the essentials you can always throw in some more bits and pieces to eat. CLICK HERE TO DOWNLOAD THE PRINTABLE MENU! 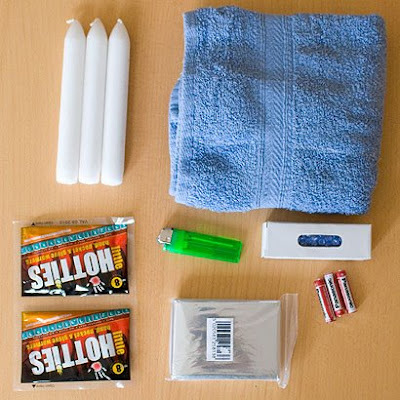 3) Two small hand warmers. 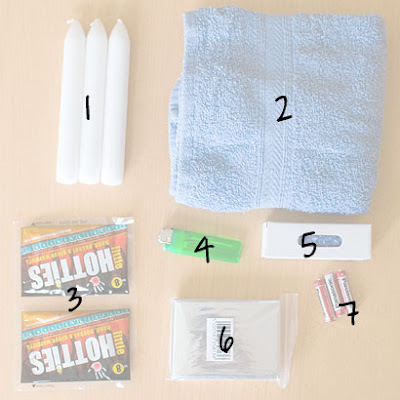 7) Batteries for the torch. I bought most of the bits on eBay. Because PayPal isn't real money, right? I've used a small ziplock bag. 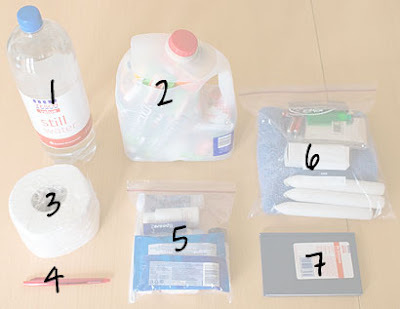 1) Alcohol gel for hand sanitation. 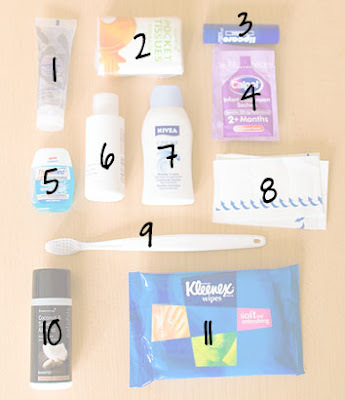 5) 2-in-1 toothpaste and mouthwash. 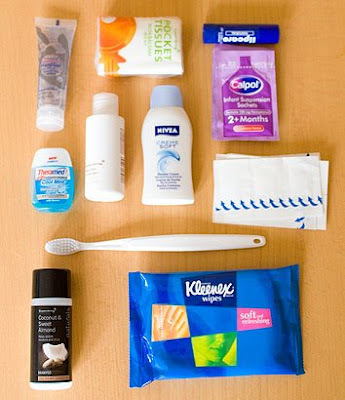 My pack also contains sanitary protection, a hairbrush and a hairdryer. Just kidding about the hairdryer. Noah's contains three nappies (diapers - he still wears them at night) because I haven't gotten around to packing spare clothing and if he's going to live in the same underwear for three days he'd better not pee in them the first night! The notebook and pen go into the rucksack's front pocket. 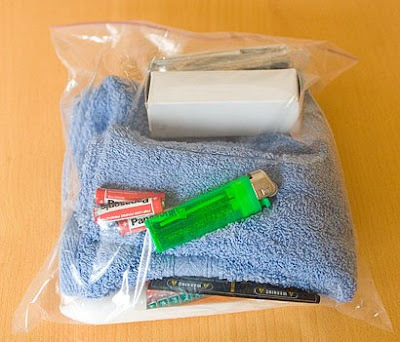 I still need to add a ziplock bag to each kit containing copies of important documents. Grant and mine will contain things like proof of address (bank statement, council tax bill;) a list of telephone numbers such as car insurance, house insurance, life insurance, bank, etc and our policy numbers; copies of our passports (we'll each have copies of all four passports; the kids will only have their own;) copies of birth certificates (ditto;) and a family photo (in case we need to prove that the kids belong with us.) Also, we'll all need to carry some cash. I also plan to pack some spare clothing or at least underwear. Here's everything packed into the rucksacks. 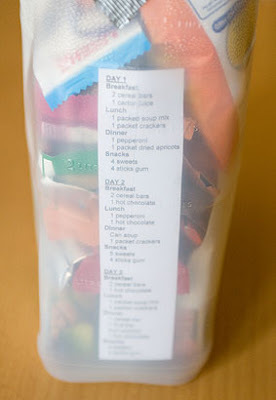 They aren't big bags and yet you can see that there is still room to add the above mentioned extras. 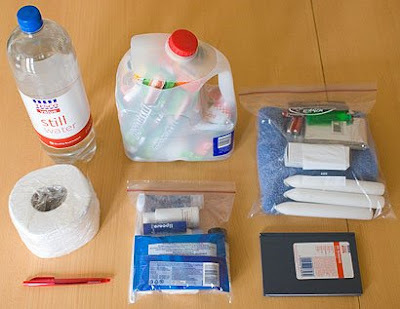 But at least for now we are prepared with the basics. I had thought of throwing in some chocolate but decided I wouldn't bother because I could see myself raiding the kits in a moment of PMS chocolate craving madness - because we all know that that is a real emergency.